Hearing aid prices vary greatly, you could pay between £500 and £2000 for one hearing aid. This is a hefty investment, especially if you need two of them. So why the huge price difference in hearing aids? Here’s our guide to how much technology you really get for your money. Basic hearing aids are available for around £500-£800. They are aimed at users with quieter lifestyles who need a hearing aid for 1-1 conversation, listening to the TV or radio and talking on the phone. These hearing aids generally have the fewest channels, usually around 3 or 4. Hearing aids use channels to process the sound they receive. The more channels a hearing aid has, the better the sound quality. They have 2 or 3 settings allowing you to change your hearing aid for different listening situations. Most of these hearing aids have a feedback reduction program and may also have a program for simple noise reduction. Hearing aids in the £800 to £1000 range are suited for small group conversation and social events that are not too challenging for listeners such as shopping, theatre or small group meetings in quiet surroundings. Some may have up to 12 channels for sound processing. Other programs may include background noise reduction, a sound softener for sudden loud noise, as well as a high frequency compression programme, which brings harder to hear high frequency sounds within your hearing range. Some of the more expensive in this price range may have wireless capability allowing two hearing aids to synchronise their settings, so if you change the volume on one hearing aid, the other changes as well. Along with all the features mentioned above, these hearing aids may have around 15 channels for processing sound. Many have 5 or more programmes for different listening environments so that your hearing aid can be tailored to your needs. Tinnitus treatment programs are often available at this price level. They play relaxing sounds to reduce the symptoms of ringing in the ears. As well as a more finely tuned noise reduction program they may also have a sound softener and directional microphones, allowing you to focus on sound in front of you. In the £1400 to £1700 price range are hearing aids designed for more demanding environments such as business meetings and busy restaurants. Along with the features above, hearing aids in this price range often offer binaural hearing. This means that their wireless capability allows them to synchronise their settings as well as detect changes in the environment and make automatic adjustments so your hearing is more comfortable. In noisy environments the background noise is automatically reduced allowing you to focus on the conversation. Many have around 17 channels for sound processing. In the £1700 to £2000 price range are hearing aids for the most demanding of social situations. They typically have around 24 sound processing channels as well as sound compression programs which recognise and enhance speech sounds, even in noisy environments. They have the highest number of personalised programs so you can have different settings for different listening environments. They are able to detect changes in the environment and make subtle changes to make listening easier. They also have the widest bandwidth, allowing them to detect a wider range of sounds. Special music programs make listening to music easier and without any distortion, making the sound clearer. The ‘made for iPhone’ range allows streaming directly from certain Apple devices without the need for an additional accessory. It also allows you to change the settings of your hearing aid from your phone and uses GPS to remember your favourite location settings and changes them automatically. Other brands have apps that let you change your hearing aid settings from an Android phone. Another thing that will affect the price you pay for your hearing aid is the size and style. Generally the smaller hearing aids, such as IIC (Invisible In Canal) or ITC (In The Canal) are more expensive if you want more features and programs. Some of the latest technology, such as ‘made for iPhone’ is only available in the larger behind the ear style, however they are still in the higher price range. 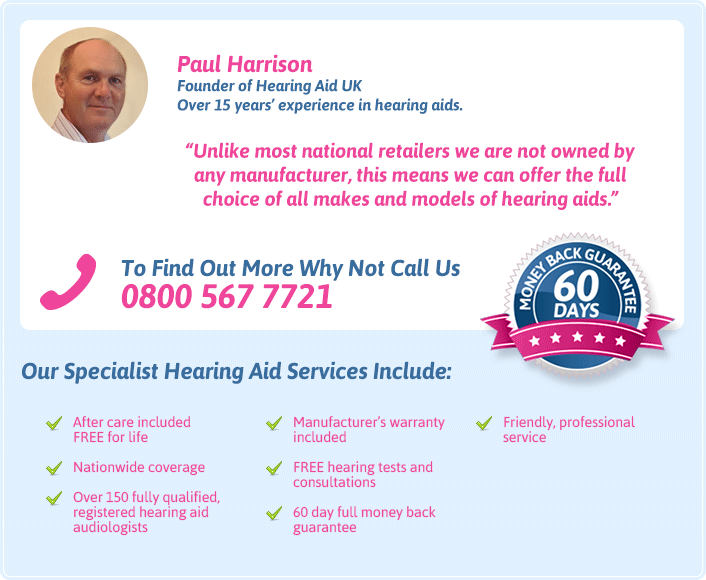 Whilst there is a great difference in cost between hearing aids, there is also a great choice. There is no need to buy features that you will never use, but some of them could make a huge difference to your life. Think about where you will use your hearing aid and which level of technology would suit you best.